Nothing about bikes for a change but thought it may appeal to those with an appreciation of technology, history and art. 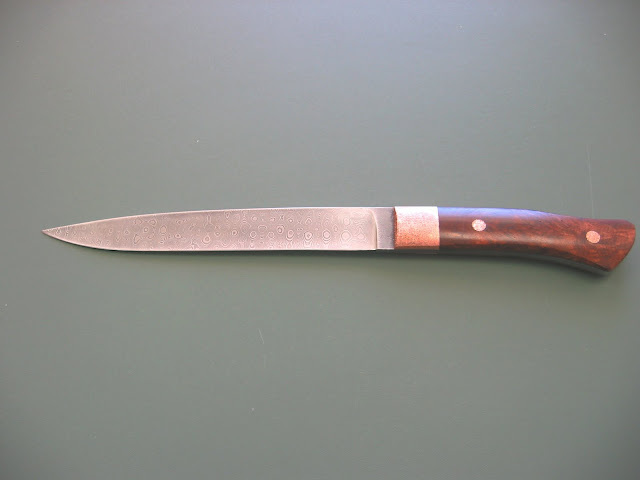 It must be about 4 decades ago when I saw a TV programme on knife and sword-making using the Damascus steel (also known as pattern welded steel) process. It's a technique at least 1500 years old and is practically a lost art in the age of mass production. It’s how the original Middle-Eastern scimitar blades were made along with the Japanese Samurai Katana swords. One presumes that there must have been technology transfer even in those days, for them to have come into being at much the same time but be so geographically far apart. The principal difference between the Middle Eastern and Japanese methodology is that whereas a Katana is highly polished, the Middle Eastern blades were etched to expose some of the different layers. Depending on how the billet is spot-hammered or twisted during the forging process gives different patterns on the blade as these various layers are exposed during grinding and polishing. As an engineer, I was blown away with both the ingenuity of the Damascus technique and the sheer beauty of the finished object. Owning one would be akin to owning a piece of history but that wasn't even a consideration back then. Fast forward nearly 4 decades where the family had accumulated some nice art objects along the way. On a visit to Christchurch, we saw a one-off pocket knife in Damascus steel at an arts centre which had been made by a local forest park ranger. That was all that was required to start the yearning again and we decided that if possible, we would get a carving knife commissioned so it was both practical and an object of art which we could hand down as a family heirloom. The Internet is truly a wondrous thing and lo and behold, we found 2 people in NZ with international reputations who still practised the ancient skill! After a bit of dialogue, one of them accepted a commission to make a carving knife for us. You'll understand that the manufacture of such a one-off item from scratch is not cheap, but neither is good original art. A couple of months after sealing the deal, it arrived by registered mail and the result was breathtaking. 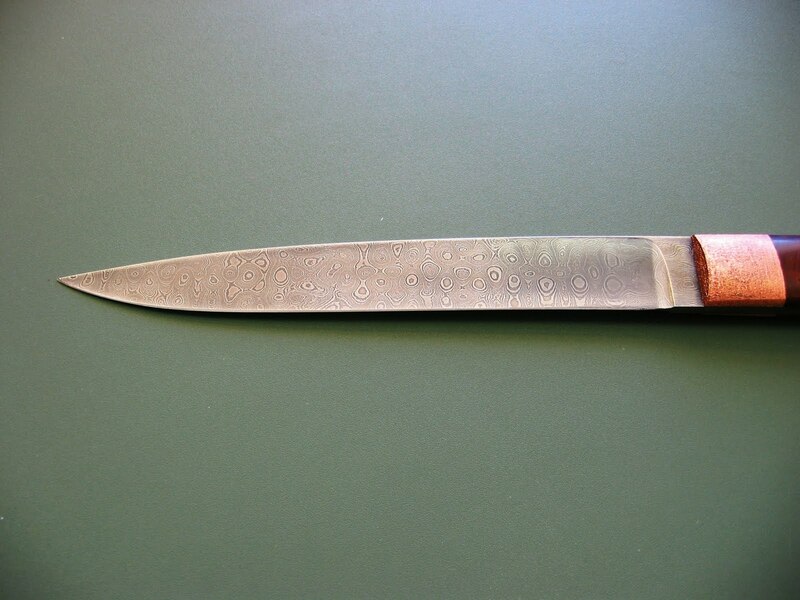 It's a 10" drop point raindrop pattern Damascus ferrous blade, Canadian burr maple treated handle with etched copper fittings. It’s a truly stunning piece of workmanship and the only problem now is that all our 3 kids (who are great cooks) want to inherit it! Sharp is an understatement and the crisp “ting” noise when tapping the blade is something else! The photos simply don't do it justice, but here are some anyway. The original file sizes are large so you can click on the photos to enlarge detail. It's not that easy to see but along the top edge shot below, the major layers from the billet folding process are just visible. The burr maple has the most amazing luminescent grain. This commission gave me nearly as much pleasure as the emotional surge one gets from buying a new bike and the history connected with the process makes it ultra-special too. It's wonderful that there are still craftspeople round the world keeping the ancient arts alive. Now you're on a slippery slope: next you'll be wanting a meteorite damascus knife. We've been conditioned to accept inferior goods in the name of low prices, but the work of a master craftsman is a true sight to behold. Sort of like the difference between a Corbin seat and one handmade by a master seatmaker. They just don't compare. Beautiful piece. Checked out the websites - some incredible workmanship there. Hahaha - what a great idea, I'd better go and talk to the bank manager! Yep, it's a privilege to see master craftsmen work. I might post a photo sometime of a wrought iron rose I had commissioned for Jennie's birthday a few years back. Made by a smith who competed at world champs level. Thank you - I should use it more than I do. Yes, there is indeed some wonderful work and I hope those skills continue to be handed down. Geoff, your knife is beautiful. It's good to know that there some left who practice this ancient craft. The weather gods hate me! Night riding - love it or loathe it?